Sensitivity and specificity have been reported as .90 and .99 respectively, while -LR is .10 and +LR is 90. Malanga et al concluded that the posterior drawer test was both very sensitive and specific, but is also enhanced by the presence of a posterior sag sign. Budoff and Nirschl agree that the posterior drawer is the best test to determine PCL integrity, but conclude that grading is the most important as this will determine the course of treatment. ↑ Flynn TW, Cleland JA, Whitman JM. Users' guide to the musculoskeletal examination: fundamentals for the evidence-based clinician. United States; Evidence in motion: 2008. ↑ Magee DJ. Orthopedic Physical Assessment: 5th Edition. St. Louis, MO: Saunders Elsevier; 2008. ↑ Malanga GA, Andrus S, Nadler SF, McLean J. Physical examination of the knee: a review of the original test description and scientific validity of common orthopedic tests. Arch Phys Med Rehabil. 2003;84:592-603. ↑ Budoff JE, Nirschl RP. 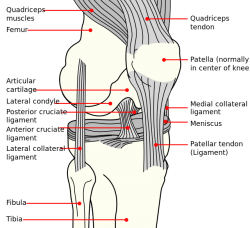 Knee problems: diagnostic tests for ligament injuries. Consultant. 1997;919-930.